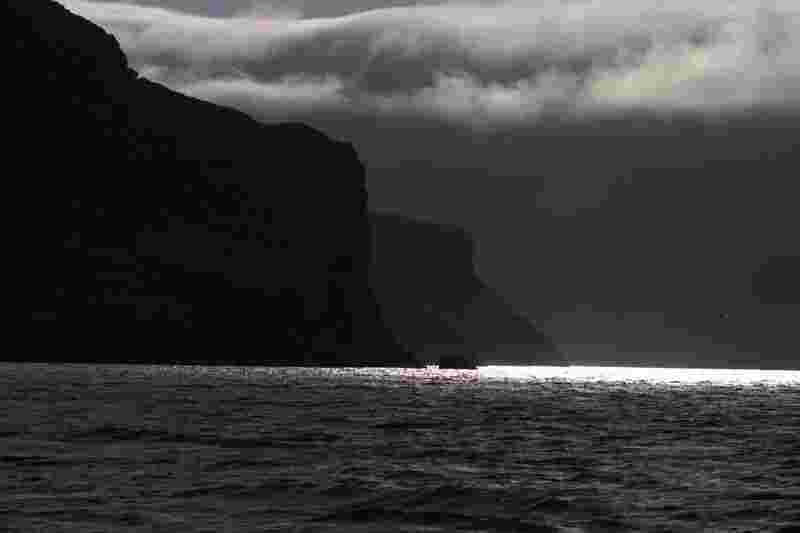 It’s our fifth day in the Auckland Islands and so far we have been offered only one day with calm winds. We have become quite good at the game of moving the boat from one end of the island to the other, just to find some protection from the wind. Currently we are in the southern part of the island, in Carnley Harbour. Yesterday and today, we could only deploy video and trap units in the shallow depths on the west and south coasts. They revealed an underwater world strongly dominated by crabs. We caught hundreds of them in the traps. Several specimens have been kept for the Museum, but the majority of them were released back to the sea. On the video they formed a pile above the bait bag in a matter of a few minutes. 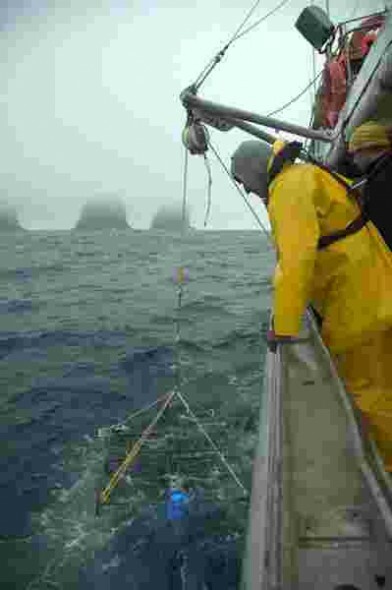 Earlier in the day we transited along the west coast of the main island, in very poor visibility. However, within a few minutes, the sky opened to let us discover the magnificent vertical cliffs of the weather-bashed coast. Some peaks towered above at more than 300m high. We all felt rather blessed working in such a dramatic place. During an episode of particularly strong winds we were fortunate to be able to work within the confines of Port Ross, a sheltered harbour in most weather. After reconnaissance of the coastline using the zodiac, we found a suitable site to sample the fish fauna of the intertidal zone. Our findings indicate that the area is particularly rich in triplefins and clingfishes. Recovering a video unit deployed in shallow water of Auckland Island west coast. We are now in the last days of our journey and are hoping for some light winds to safely sample the deeper part of the south-west coast. Just a few hours please! Note: These images look a bit strange. We had to reduce their size to the maximum to be able to send them over our satellite internet connection. 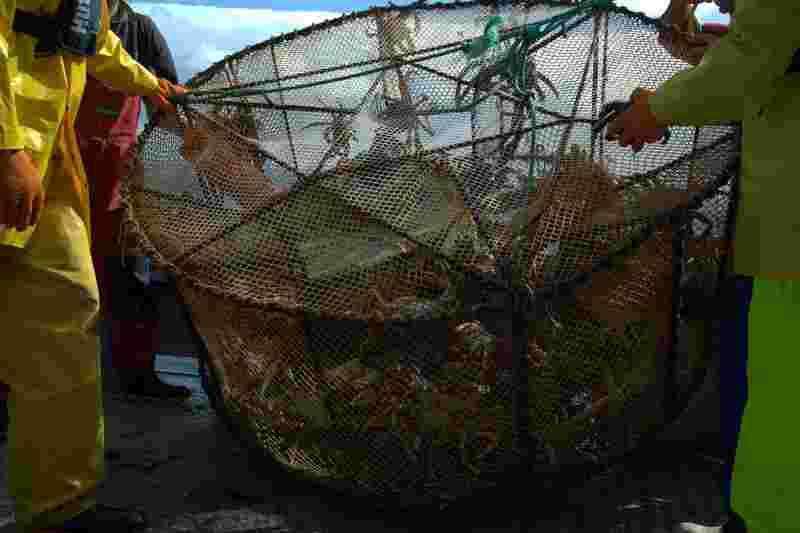 Can’t wait to see the video of the crabs overwhelming the bait bag – sounds very creepy! Well done fish team… it looks as you are doing an amazing jobs!! Will cross my fingers for some good weather.